Biology is usually a mandatory course at both the high school and college levels. At some point or another every student has to take it. Some students find biology challenging, but it doesn't have to be. As with math, and a few other subjects, learning biology is a cumulative process. Before you can understand more complex biological concepts and processes, it's essential you understand the basics. Below we'll explore proven tips and strategies for improving your ability to study and learn biology. Reading your biology text, or copying your classmate's notes, will not compensate for missing class. Biology is a complex, hands-on subject. It involves learning biological systems that require explanation and experimentation. Biology is also a cumulative subject. What you learn in one class will create the building blocks for what you'll learn in the future. Arrive at each lecture having read the textbook, completed all lab assignments, and reviewed your notes from the prior lecture. You'll get much more out of lectures if you come to prepared. Students who regularly attend their biology class perform far better than those students who don't. "Catchup" may be an acceptable game to play in history, home economics, or social science, but it doesn't work in biology. Again, the process of learning biology is cumulative. Each new biological concept you learn builds upon previous knowledge you've acquired. Much of the knowledge you'll acquire as you study biological will come from hands-on experimentation and exploration in laboratory settings. Making up a lab is difficult. Making up several labs at the end of the semester is impossible... and fruitless. Staying on top of the subject matter and completing your assignments on time is key to learning biology. Anyone can learn biology, but it's not always easy. Biology doesn't require as much math as physics or astronomy, but it can still be challenging to understand biological systems and processes. One of the keys to effective learning of biology is to master general concepts before tackling specific ones. For example, before you can understand the Krebs cycle you need to have a basic understanding of animal cell structure. Study each new biological concept and process thoroughly before moving on to the next level. There is theory in biology, but it is also a practical, hands-on science. Learning biology theory by reading your textbook or listening to a lecture is one thing, putting biology into practice in a laboratory is a whole different experience. Experimenting biological systems and processes in the laboratory is one of the most effective ways to learn biology. What you do in the lab will stay with you a lot longer than what you read in a book. 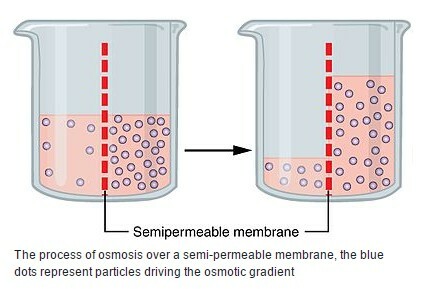 Osmosis is any process involving the net movement of molecules from a solution of lower concentration through a semi-permeable membrane into a solution of higher concentration until concentrations on each side of the membrane are equalized. Employ drawings and diagrams to study biology. It will improve your understanding and recall. You'd never consider studying to become a doctor and not expect to learn all the parts of the human body, or a mechanic without knowing all the part of a car. Well, the same holds true for biology. Even though you may not plan on becoming a biologist, or did not choose to take the biology class you now find yourself in, if you want to do well in biology, you need to (1) pay attention to the terminology and (2) learn it. To learn biology, you have to understand the words and terms used to explain it. As you encounter words you don't recognize write them down and then look them up. When words seem to have prefixes or roots, take the time to break them down and understand their parts. Reading biology to learn requires much more than skimming chapters or running your eyes over the pages looking for main points. Successful biology students attack each reading assignment with a pencil in hand, a notebook at their side, are actively engaged, and read with purpose. Every time you tackle a reading assignment, write down in your notebook important information, including vocabulary, processes, concepts and explanations. Writing things down (1) helps to process and understand challenging material and (2) improves retention. Your notes will also help you review for exams. It's tempting to skip over unfamiliar terms and new vocabulary. Resist this temptation. Write unfamiliar terms and vocabulary down in your notebook and then look them up. This may seem tedious (because it is), but it is a necessary part of learning biology. Read the detail, but read for meaning. After reading about a new concept, in your own words write down in your notebook a summary of the concept. Doing so will improve your understanding of the concept and provide you a valuable tool to prepare for your exam. We can't reiterate how effective it is to use diagrams and drawings to study biology. The same holds true when reading biology texts. Drawing pictures and developing diagrams to represent and describe the processes and systems you read about in your biology text will improve understand and recall. Biology is the basis of so many of the natural sciences and covers a myriad of topics from osmosis and diffusion to homeostasis and cell biology to virology and immunology. It is truly one of the most diverse subject areas taught at any high school or major university. (No wonder so many students find the study of biology to be overwhelming at times.) As such, the study of biology requires a lot of rentention, recall, and memorization of information. The following are proven tips for memorizing information as you study biology. There is no better way to make sure you understand something than to teach it to someone else. Teaching biology to others moves information from your short-term to your long-term memory. Set aside time each week to teach the lessons you've learned to someone else. Biology is full of terminology and specialized vocabulary. The best way to learn new terminology and remember it is to use it. Each time you encounter a new term or word, write it down, look it up, and then use it in a sentence. If you have a classmate you can practice with, take some time each week to review aloud and discuss the new terminology you've encountered. For some reason the human brain loves relationships and associations – especially associations of familiarity. Take the time to associate complex or unfamiliar biology terms and vocabulary with familiar words and phrases and you'll remember them forever. For example, to memorize Kingdom, Phylum, Class, Order, Family, Genus, Species (taxonomy order) you simply have to remember King Phillip Came Over From Great Spain. Flash cards are as effective for learning biology today as they were in the 1950s. Write terms and concepts you're trying to memorize on one side of a 3x5" card and their definitions and descriptions on the other side. You can study biology using flash cards on your own or with another classmate. The following are some of the most effective methods and strategies for preparing for biology exams. Biology as a science is pretty concrete. While you can expect to be introduced to new theories, most of the basic biological tenets and concepts you'll learn as a high school or undergraduate college student have already been proven. As such, what biology professors and instructors teach students and then test them on, doesn't change a whole lot from year to year. A very effective way to prepare for your biology exams is to review the questions found on past biology exams administered by your instructor. However, biology exams can vary quite a bit so it's important not to simply memorize questions and answers. Use past exams to identify major concepts you're likely to find on your exam and to test your knowledge of these concepts. Past exams will also give you an idea of what question formats to expect (i.e. essay, multiple choice, true/false, etc.) Review as many past exams as you can get your hands on. Review all your lab notes. If you spent time studying the different parts of the animal cell in lab, there's a good chance you'll be required to label the different structures of the animal cell and explain what they do. Your instructor is the one giving the exam, so pay close attention to what he or she finds most important and interesting. As important as your textbook is, you'll fare better on the exam by going back and reviewing everything your instructor taught you in class and during labs. Review all your assignments for the semester. Your assignments cover the topics your instructor believes to be most important. As such, you can bet that you'll find exam questions that come directly from the assignments you completed throughout the semester. If you've gotten this far and still haven't figure this one out then we recommend reading this page again. To do well in biology requires jumping in with both feet. Having one foot in and one foot out doesn't work. At the beginning of the semester, regardless of your major, personal interests or dislikes, decide that you're going to give biology you're whole heart. Do this and you'll do well in your biology class. Editor and user recommended study skills resources, guides and learning tutorials that will help you learn biology and improve your study skills.